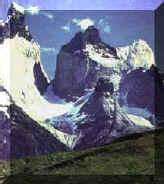 Over 1400 miles south of Santiago lies the area known as Patagonia, on the northern banks of the Strait of Magellan. The city of Punta Arenas has a wonderful view of Tierra del Fuego, just across the strait, and is the push-off point for visiting Paine National Park. This park, the largest national park in the world, is filled with some of the most beautiful and awesome scenery on earth. 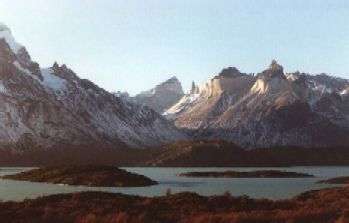 The jagged peaks of the well-known Towers of Paine, formed by massive glacial movements, drop dramatically into a lake, and wildlife such as the Andean giant condor, huanaco (the 4th member of the South American camel family), deer, red fox, native ostriches called "nandu," gulls, swans, ducks and flamingos abound. The climate of this area is cold in winter, with gale force winds, but the summers are mild, with an average temperature of 68 degrees Fahrenheit during days, which have twenty hours of sunshine. Obviously, Spring through Fall, from October through April, is the ideal time to visit! Day One: Punta Arenas to Puerto Natales Morning arrival in Punta Arenas and transfer across the Patagonian Plains to Puerto Natales on the shores of Ultima Esperanza Sound and your selected hotel. *Single rates available only for a minimum of two passengers traveling together. Day One: Arrive Punta Arenas Morning arrival in Punta Arenas and overnight. IMPORTANT NOTE: Flight does not operate Saturdays and Sundays. To extend your trip further, check out EcoAdventures' programs in Argentina.